Third-party logistics providers offer “supply-chain” services to producing entities, maintaining one or more cogs in the flow of goods and products from the initial point of production to the final destination – the consumer. Whether you are a group that specializes in obtaining raw materials needed for drug manufacturing, a storage facility that houses a distributor’s product while it is being prepared for shipping, a trucking company that transports pharmaceuticals from one place to another, or a comprehensive 3PL that handles all of these services together, there are important legal requirements that your business must satisfy. United States law requires a wholesale drug 3PL to be licensed in the state in which it does business. In certain states, there is a license specific to third-party logistics providers. Florida, for example, requires 3PLs to obtain a Third Party Logistics Provider License from the Division of Drugs, Devices and Cosmetics. 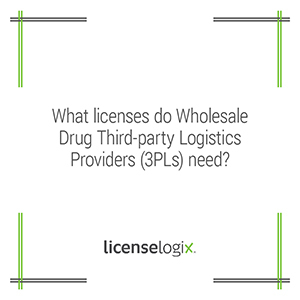 Other states may not have a specific 3PL license and may require the 3PL to become licensed as a wholesale drug distributor or other type of entity. The department that administers the appropriate license varies from state to state as well. If the 3PL transports drugs between states, it must be licensed in all of the states in which it does so. If the state in which the 3PL does business has not established a 3PL license requirement, the 3PL must file with the U.S. Secretary. Applying for the appropriate license in each required state can be comprehensive and time-consuming. Applicants will typically be asked to provide samples of contracts, lists of customers and states in which the 3PL operates, and proof of general liability insurance. Application fees can range from several hundred to several thousand dollars. If you maintain a brick-and-mortar facility, you will more than likely be subject to state inspection of that facility. The entire approval process can take between four weeks and three months depending on the licensing division in the state in which you are applying. In addition to obtaining a license in each state in which your 3PL operates, there may be other requirements that your company must satisfy in order to remain compliant. For instance, the FDA requires that a wholesale drug 3PL file an annual report of every state in which it operates, its applicable license numbers and expiration dates, and records of any disciplinary actions it incurred that year. It goes without saying that failure to comply with any facet of federal 3PL regulations can result in heavy fines, cease-and-desist orders, and potential disintegration of your business. How can LicenseLogix help third-party logistics providers? LicenseLogix will research the licensing requirements for every state and jurisdiction in which you operate. Your Dedicated Account Manager will then prepare and submit your 3PL license applications and consolidate all license fees into one simple invoice, saving you time, money, and frustration. Once your licenses have been issued, we ensure that you renew on time and remain compliant will all 3PL licensing laws. If you’re a 3PL, you recognize the benefits of outsourcing complicated aspects of an industry to experienced professionals. Let LicenseLogix handle the licensing of your third-party logistics provider. Live chat with our license experts or call 1-800-292-0909 today.